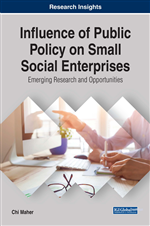 This chapter provides an overview of political developments and public policies which enabled the development of UK third sector social enterprises. The chapter adopts a chronological framework in tracing the development of UK third sector social enterprises from the co-operative movement to the influence of the ‘Third Way' doctrine (Giddens, 1998). This expression of New Labour political values had a significant impact on shaping public policy and for third sector social enterprise development. This also included a policy solution to a range of identified social, health, environmental, community and economic problems particularly at the local and regional levels (National Audit Office, 2007), including Scotland, Wales and Northern Ireland. This was subsequently supported by European Commission's social enterprise development agenda. The roots of social enterprise developments in the UK can be found in the co-operative movement. A co-operative is defined by the International Co-operative Alliance (ICA) as ‘an autonomous association of persons united voluntarily to meet their common economic, social, and cultural needs and aspirations through a jointly-owned and democratically-controlled enterprise’ Birchall (1997). They ‘are based on the values of self-help, self-responsibility, democracy, equality, equity and solidarity’. Co-operatives have functioned as a means to fund socio-economic agendas since as early as the mid-1800s (Mellor, Hannah, & Stirling, 1988). Robert Owen (1771–1858), founder of the co-operative movement, believed in putting his workers in a good environment with access to education for themselves and their children. These ideas were put into effect successfully in the cotton mills of New Lanark, Scotland. New Lanark became a ‘model community’, where Robert Owen established the first infant school in the world, a crèche for working mothers, a rule that no children under 10 were allowed to work in the factories, free medical care, and a comprehensive free education system for children (Ridley-Duff & Bull, 2011; Williams & Thompson, 2011). In the 1840s co-operatives and mutual support organisations (mutuelles) appear as a form of resistance by the workers grouped in corporations of craftsmen against deregulation of the associative economy, in order to secure protection against social risks (disease, accidents, death), professional risks (unemployment, strikes) and the alienation from basic needs (shelter, food) (Gueslin, 1987; Birchall, 1997; Demoustier, 2001; Nussbaumer, 2002). By 1844, a group of 28 artisans working in the cotton mills in the town of Rochdale, in the North of England open the Rochdale Equitable Pioneers Society. The group decided that customers should be treated with honesty, openness and respect. They should be able to share in the profits that their custom contributed to and should have a democratic right to have a say in the business. Every customer of the shop became a member and so had a stake in the business. In 1863, the North of England Co-operative Society was launched by 300 individual co-ops across Yorkshire and Lancashire. By 1872, it had become known as the Co-operative Wholesale Society (CWS) (Kendall & Knapp, 1996; Moulaert & Ailenei, 2005). According to Defourny and Develtere (1997), the twentieth century was a period of intense experimentation with various forms of co-operative ideologies and initiatives to support disadvantaged members of our society; this influenced the development of third-sector social enterprises and government policy agenda. In the UK, the co-operative socialist agenda of the Labour Party was articulated in Clause Four of its constitution “…to secure for the workers by hand or by brain the full fruits of their industry and the most equitable distribution thereof that may be possible upon the basis of the common ownership of the means of production, distribution and exchange, and the best obtainable system of popular administration and control of each industry or service” (Adam, 1998).